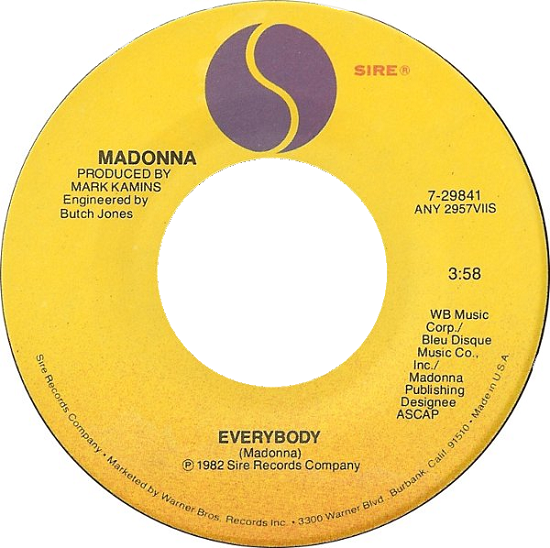 It may seem like only yesterday but 25 years ago on April 24, 1982, Sire Records honcho Seymour Stein released a single called Everybody on Warner Bros. Records by an unknown singer from Rochester, Michigan by the name of Madonna Louise Veronica Ciccone. To say the world would never be the same is an understatement. The song went on to become a huge dancefloor hit and was heard all over the radio in the Summer of 1982. That little girl from Michigan would go on to become one of the most famous entertainers and cultural icons in history – selling close to 200 million records and remaining a star of enormous magnitude and influence for the next 25 years. She’s just getting started. Long Live the Queen and Happy Anniversary to Madonna. The announcement came as a surprise to many fans who had always understood the release date of Everybody to be October 6, 1982. While the erroneous April date was likely just a simple mistake on Liz’s part, the lack of any official retraction/correction to the post has led to much confusion about the single’s release date in the years since, with the press often assuming the April date to be factual given its reputable source. However, the sequencing of the catalogue numbers for both the promotional and commercial releases of Everybody, as well as its charting chronology, offer clear evidence that its originally reported release date of October 6, 1982 is in fact the accurate one. “Dance and sing!/Get up and do your thing!/Everybody!”-IS A ROCK & ROLL RALLYING CRY!-and Madonna has been doing it for close to 35 years and counting! Long may Queen Madge rave and confess on the Dance Floor of Life, Love and Humanity! Madonna Forever!